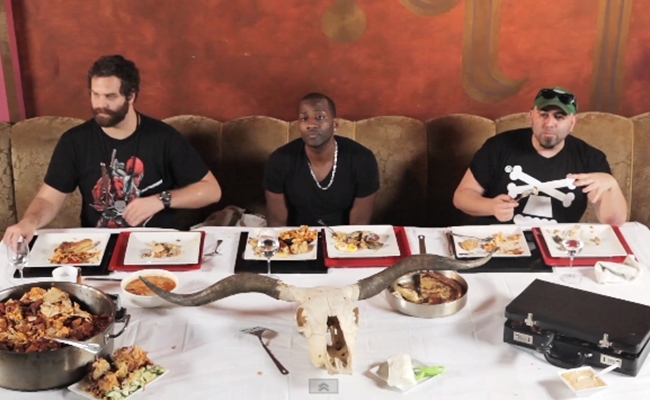 Epic Meal Time, the Internet’s most popular cooking show, has begun to branch out. The 12th most subscribed channel on YouTube has launched Epic Chef, an cooking competition series that shows us what happens when you cross Iron Chef with Harley Morenstein‘s brash, rude, ridiculous, and over-the-top brand of culinary know-how. As with Iron Chef (and several similar web series), Epic Chef pits two highly-regarded chefs against one another, with several secret ingredients giving the contestants the same starting point. Epic Chef‘s first batch of secret ingredients included several breakfast meats, beans, mac and cheese, rum, and, of course, a briefcase full of bacon. YouTube Money! Of course, this being Epic Meal Time, Morenstein and his fellow judges (YouTuber DeStorm and Ace of Cakes’ Duff Goldman) spend more time sending up the basic notion of cooking shows than actually providing worthwhile analysis. The contestants are verbally abused (while overly dramatic music plays), forced to take multiple shots, and encouraged to eschew gourmet presentation in favor of delicious chaos. I’m shocked any chefs would agree to go on the show, but I guess it would be fun to open a jar of mayo with a chainsaw or split a bottle of Sriracha in half with a meat cleaver. Epic Meal Time has gained close to three million subscribers by blowing away preconceptions about how much absurdity is possible within a cooking show. Before EMT came around, who would’ve believed a 900,000 calorie meat monstrosity could be anything but a carnivore’s daydream? Epic Chef works with a similar premise. Everything, from the utter disrespect shown to the chefs to the ridiculous mix of secret ingredients (green Jell-O will be used in a later episode) laughs in the face of previous cooking shows by providing a nuttier alternative. That originality is what will keep me coming back when new episodes are released every Friday. Side note, we’ve got to figure out why DeStorm didn’t take his shot in the beginning of the episode. Was he having a bad day? Does he only consume Hot Pockets now? It’s a mystery.